Fish force water through their gills, past many tiny blood vessels. The gills take oxygen from the water and let water whisk away carbon dioxide. Gill filaments are the red, fleshy part of the gills; they are the smallest division of the gill and they take oxygen into the blood. Each filament has thousands of fine branches which are exposed to the surface of the water. The branches contain a thin epithelium that separates them from the water, allowing oxygen and carbon dioxide pass through easily. 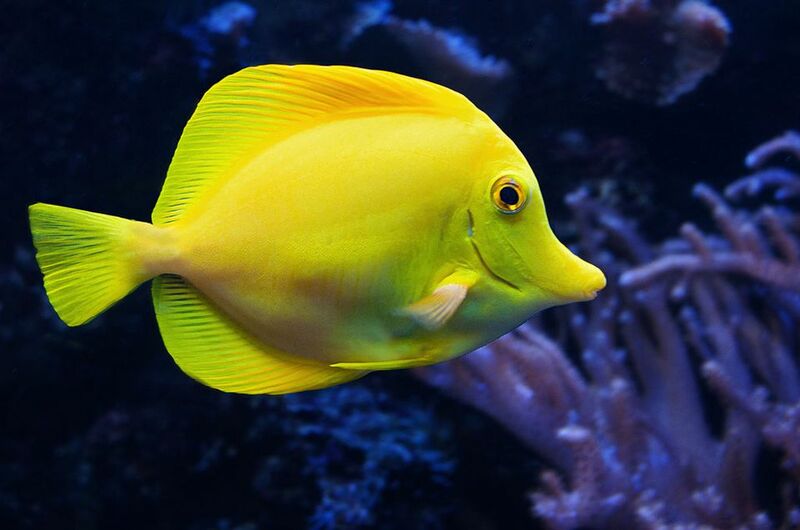 Not all fishes completely rely on their gills to breathe. Some species absorb a large part of their necessary oxygen through the skin, particularly when they're juveniles. Others have lungs that have developed to breathe air in will actually drown if they don't have access to the water's surface. The gills in fish are like lungs in people: it's the organ responsible for absorbing oxygen and getting rid of carbon dioxide waste. The gills also regulate levels of ions and the pH of the blood. The gill filaments of bony fishes are called "primary lamellae." They are intricate structures that have a large surface area. Smaller secondary lamellae are offshoots of the primary filaments. The secondary lamellae contain small blood capillaries and blood flows in the opposite direction of the water. As a result, the water flowing beside the secondary lamella always has a higher oxygen concentration than that in the blood so oxygen is absorbed along the full length of the secondary lamellae. Active swimming fish have gill filaments that are highly developed to maximize the absorbed oxygen. Less active fish that live on the bottom usually have gill filaments that absorb smaller volumes. Most fishes have gill arches. These support the gills and they are bony and shaped like a boomerang. Each gill arch consists of an upper and a lower limb that is joined in the back. Gill filaments and gill rakers are attached to the gill arches. The gill arches offer support for the gills as well as the blood vessels. Arteries that enter the gills bring blood with low oxygen and a high concentration of wastes. Arteries that leave the gills contain blood with little waste that's flush with oxygen. Gill rakers are bony projections that help the fish feed. They point forward and inward from the gill arches. Their number and shape point to the diet of the fish: Widely spaced gill rakers are evident on fish that eat large prey such as other fish, which prevent the prey item from getting free and escaping between the gills. A larger number of thinner, longer gill rakers are seen on fish which eat smaller prey. Species that consume plankton and tiny matter suspended in the water sport most gill rakers which are extremely long and thin. Some fish have more than 150 just on the lower arch. About 25-30 days after spawning, gill filaments are apparent as an outgrowth from the caudal side of the gill arches. These filaments are fine like threads and each contains one blood vessel. By day 70-75, they reach their maximum length. At the end of three months, internal gills replace the external gill filaments.